Striker Concepts has created an innovative gym glove that offers full coverage protection against heat, friction and moisture, thus eliminating blisters and callouses. Troutman, NC, April 17, 2019 --(PR.com)-- Striker Concepts is excited to announce an innovative new gym glove, the STRIKER® Gym Skin. It was the goal of STRIKER® engineers to develop a solution that offered full coverage protection against intense friction, rubbing, heat and moisture. They were able to accomplish that goal in a glove that feels like it is barely there. Gym Skins are made of thin, breathable, neoprene fabric which is lightweight yet extremely durable. They offer protection of the palm, as well as the area between the thumb and forefinger. Both areas are known for debilitating blisters. This design protects the user’s hands while still allowing for 100% dexterity. Fingers are free to grip during weightlifting, cycling, yoga, and functional fitness training. 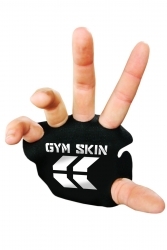 The icing on the cake, unlike typical gym gloves, the Gym Skins do not retain odor. Staying fit and healthy no longer has to come at the sacrifice of one’s hands, and blisters are no longer synonymous with exercise. Whether in the gym or cross training outdoors, the STRIKER Gym Skin is the perfect fitness tool to protect against workout ending blisters. The Gym Skin is available now at an MSRP of $7.99. For additional information, pictures, and demo videos please visit www.strikerconcepts.com or call 704-508-1031. Researched, designed and tested by professionals, STRIKER® products provide users with functional, innovative solutions. They are engineered for reliability and performance in demanding environments. STRIKER® is a registered trademark of Troutman, North Carolina based BISS Product Development.